The Parrot Heads’ biggest fund (and fun) raiser of the year is coming up on Saturday May 21! THE BEACH BICYCLE POKER RUN! This is an adult’s only event. All proceeds go to Semper Fi Odyssey Children’s Adventure Camp sending children of wounded/injured Marines and Sailors to camp for a week and then mentoring them throughout the school year; a chance for the community to give a little back to the families who have given so much for us. Last year we raised $7000 at this event and had 213 riders, and we hope to top that this year. Registration ($20) begins in the Emerald Club parking lot at 11:30, with DJ-JD (our own “Dr.” John Dyer) playing great tunes, raffle tickets for a variety of prizes donated by local merchants and Parrot Heads will be on sale, as well as logoed event T shirts. 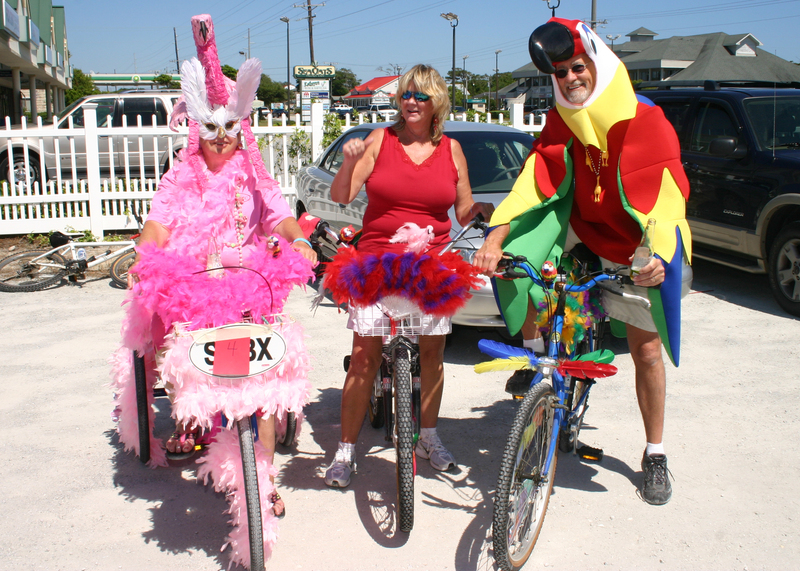 PHolks are encouraged to dress up their bikes and themselves not only for a fun time and good laugh, but to compete for great prizes in this year’s categories: PIRATES, PHINS , & PHEATHERS; judging for this starts at 1:00. At 2:00 sharp the masses hop on their bicycles and ride to six designated local restaurant/bars to pick up a poker card. Upon returning to the Emerald Club no later than 5:00, there are cash prizes for the best poker hand; $300- 1st, $200- 2nd, $100- 3rd , some free grub, and awarding raffle winners. Sela Dubb will be playing that night followed by Mike Mixer. A rowdy time for a great cause; DON’T MISS IT! !